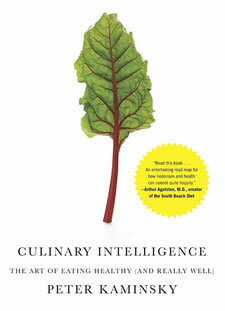 Culinary Intelligence is written by Peter Kaminsky, a food writer for Food and Wine Magazine and The New York Times. Since his profession involved eating and writing about gourmet restaurant meals he found himself gaining weight over the years. Eventually he developed a system that allowed him to lose weight while still being able to enjoy delicious food. Culinary Intelligence is an approach to food and eating that allows you to reduce caloric intake without sacrificing flavor. As a food writer, the author’s diet consisted of eating, tasting and enjoying the most interesting meals he could find. This led him to gain weight, increasing from a size 34 in his early thirties to a size 38 at the age of fifty. However, it was only when his doctor told him that his weight was a precursor to diabetes that he became concerned. But he wondered how he could manage to get healthy without giving up the food he loved to eat. He discovered how to lose weight by thinking more about what he was eating and learning to make intelligent choices. Buy the best, most flavorful ingredients you can afford. Enhance those ingredients by cooking. It is especially important to emphasize fresh, seasonal ingredients that are at their peak. For fruits ripeness is important and for vegetables they should be as fresh as possible. Everything you eat should be something that a caveman, or at least a pre-industrial farmer, would recognize as food. Since alcohol is often a source of empty calories you strictly monitor your intake, set a limit and keep to it. Kaminsky recommends no more than one glass of wine or beer daily. The primary concept behind Culinary Intelligence is the idea of maximizing flavor per calorie. Ingredients are chosen on the basis of maximum flavor and prepared with the goal of intensifying that flavor. This way you will be satisfied while eating less while still having a pleasurable eating experience. Foods such as grass-fed beef, artisanal cheeses and seasonal produce have much more flavor. Additionally cooking techniques can further enhance the flavor and texture of foods. For example, caramelized vegetables and creating a crunchy browned crust on meats produces a deeper flavor. Long, slow braises tenderize meat and help to develop the “fifth taste” – umami – often described as “deliciousness”. The book includes a few recipes to demonstrate how healthy food can be exciting and satisfying. Fresh seasonal fruit and vegetables, grass-fed beef, oxtail, free-range chicken, wild fish, artisanal cheese, Greek yogurt, eggs, anchovies, olives, capers, whole-grain pasta, white beans, herbs and spices, lemon, olive oil, grapeseed oil, sea salt. Kaminsky says it doesn’t matter what exercise plan you follow as long as you do something. Choose an activity appropriate to your fitness level and exercise on a regular basis. Culinary Intelligence: The Art of Eating Healthy (and Really Well) retails at $24.95. Encourages consumption of fresh, seasonal ingredients. Recommends elimination of processed foods and refined carbohydrates. Will appeal to foodies who appreciate quality ingredients. Some dieters will require more guidance to effectively lose weight. Does not include a meal plan or exercise recommendations. Will probably not appeal to those who don’t enjoy cooking. Culinary Intelligence is an approach to eating that helps you eat healthy without giving up the pleasures of delicious food. When you eat foods that have a lot of flavor but not too many calories you will be satisfied with smaller portions. This makes it easier to lose weight without the need to go on a rigid or structured diet.